Oh who the hell cares. The nation suffers through a 2.5 year migraine headache to determine who is going to steer the ship and no one told them the bilge pump isn’t working. Guys, the boat is sinking. Now reduced to two; proud that they have sidestepped all the losers (their now new-best-friends), and each of whom depicts the other as an inept, untested, despicable, incompetent bonehead….we get to make a choice. My choice is labor. Not that labor, i.e., pre-eclampsia, toxemia, or cervical ripening. No. 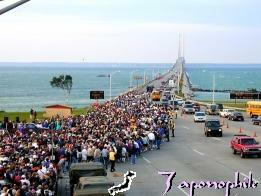 It’s the Labor Day walk on the Mackinac Bridge, 5 1/2 miles of fun accompanied by 50,000 other enthusiasts, all of whom have a low entertainment quotient. Why miss the opportunity when it is only offered once a year ? Led by the lovely Jennifer Granholm, arguably the most attractive governor in the country, even though her ability at governance is in serious question, the fun begins at SEVEN A.M. Departing from St. Ignace in the Upper Peninsula (hereinafter referred to as the U.P. 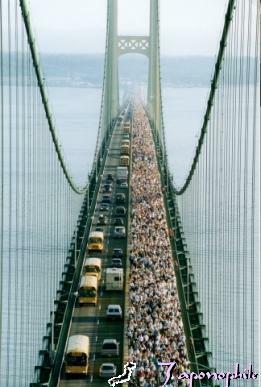 )* the bridge authority warns: Participants should understand that walking involves risks of injury from falls due to the surface condition of the bridge, contact with other participants, and the effects of weather, including high winds, high heat and/or humidity. So there you have it, high risk, possibly resulting in death or permanent injury, but why let that ruin a good walk across the most beautiful bridge in Mackinac County ? Today the only political issue to consider should be the mutual benefit derived from generations of genuine labor. Sorry, but I just don’t care who the vice presidential nominees will be. And yes, the Governor of Alaska is a looker, too, the perfect brunette complement to the blonde Cindy McCain, but on Monday, we’re walking, not voting. *The U.P., a.k.a. The YouPee, an irregular perimeter of land surrounded by water, where the residents are decidedly square; as in uncool, nerdy, simple, & not hip. But we love it up here anyway, even if all our female impersonators are women. …… a quote by the renowned furniture designer of the twentieth century, Charles Eames, provides the entry into today’s subject, PINCHING. Before you elect not to read on, be assured, this will not be a vulgar essay on inappropriate behavior. Yes, yes, one can almost hear the gag reflex as Sylvia shouts the length of her modular, “ohmigawd, Stanley, the pervert is spewing more of his R-rated trash”. No, please turn your attention to the photo below: Long a fan of the unusual sign, this was a first. Taken at the dock landing for the Neebish Islander, a ferry serving a few hundred residents across the western span of water less than 500 feet, it is located in Barbeau Township, Chippewa County, twenty miles south of Sault Ste. Marie, Mi. The channel provides passage for the Great Lakes freighter traffic from Lake Superior to Lake Huron on the scenic St. Mary’s River. So narrow, that northbound ships travel up the east side of the island, also less than 500 feet wide separating Canada (St Joseph Island) and the U.S.A. You might feel genuine concern about the porosity of our border, and the ease this most vulnerable position would be for the transfer of illegal drugs and/or aliens, but a minor presence of Customs Service and Border Patrol agents reduces most smuggling activity to cigarettes headed for Ontario in canoes and kayaks (where provincial taxes make them $ 7 to $ 8.50 per pack). The presence of the sign was precipitated by the following: so close you can wave to the crew: who, according to Wikipedia:on October 12th, 1990; the Joseph L. Block grounded in the St. Marys River (Neebish Channel) causing bottom shell plating damage by the #â€™s 1, 2, and 3 port ballast tanks including a hull puncture. The carrier proceeded in ballast to Fraser Shipyards, Superior, WI for repairs. The ship has always been a favorite of this writer. Having been born in Indiana Harbor, I was an employee (read : grunt laborer) at Inland Steel during a college summer, 1958, at $ 2.25/hour. The President and CEO then was one Joseph Leopold Block, salaried at $225,000/year. We never saw him anywhere near the blast furnaces, ample cause for me to consider a different career. Understand then, why I take serious pleasure watching 778 feet of Joseph L. Block, carrying 30,000 tons of taconite ore lazily through the Neebish Channel on a warm August day.